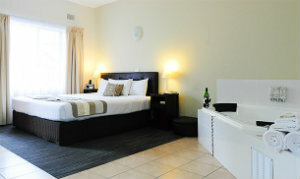 Recently renovated to 4 diamond standard Self Rated. The Sanctuary Resort Coffs Harbour is set back from the Pacific Highway in Coffs Harbour amongst a natural bushland setting. Ideally located within minutes drive to the Coffs Harbour Airport, Coffs Harbour CBD, Coffs Harbour Hospital, Coffs Harbour International Stadium & Coffs Harbour Industrial Areas. 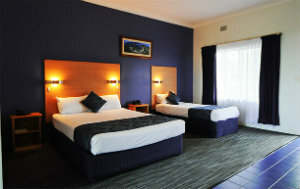 The Sanctuary Resort Coffs Harbour has 37 Spacious Rooms all with Air-Conditioning, Austar & Wireless Broadband. The Treehouse Restaurant & Bar is open Mon-Sat from 6pm with Room Service available. A buffet breakfast is available from 7am till 9am Monday to Saturday (8am to 9.30am Sunday). A 15 metre Swimming Pool with Waterslide , Tennis Court & Sauna are all here waiting for you. The Sanctuary Resort Coffs Harbour also offers practical and economical conference & function facilities ideal for seminars, meetings, weddings, wedding receptions & all types of functions.